Over the past ten months, I’ve eaten meat about 15 times. For someone who eats out often, it may be difficult to believe that I found it really easy to maintain this type of diet. There was barely a thought process, actually. After watching documentaries like Vegucated and Forks Over Knives, my body and mind rejected meat. Even my taste buds were on board and entirely stopped craving it. The old adage that KNOWLEDGE IS POWER is true. Once you’ve learned the whole story and what is going on inside the factory farms, that awareness becomes a strength and a source of satisfaction knowing you can switch to vegetables or reduce your meat intake (while easily accessing sustainable, ethically raised meat from smaller, local farmers). To be clear, I’m not necessarily suggesting you stop eating meat altogether. But, given all the benefits, reducing meat consumption might be a powerful way to make a difference. 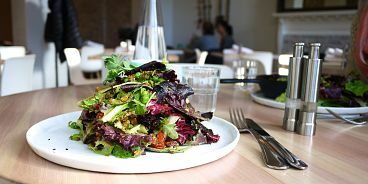 There’s even a name for it: flexitarianism – eating ethically raised, local meat on special occasions and sticking to plant-based foods the rest of the time. A good plan! 1. Animals are sentient, emotional, joyful beings — they deserve humane treatment at the very least. They’re our best friends, right? Did you know pigs are thought to be as smart as dogs? Ten billion animals are slaughtered for us to eat each year, and these days, most of them are kept in tiny cages where they can barely move. Also, they’re fed a diet of antibiotic and pesticide-rich food. Yuck! Read more. 2. You’ll be doing the environment a HUGE favor. The livestock industry is a the biggest contributor to greenhouse gas emissions (that’s more than all transportation combined). Just think about how much land is needed to raise cattle…and how much grain they eat. That is a lot of water and energy. This is really just the tip of the environmental-problem-iceberg. Read more. 3. You’ll be healthier and better looking. What’s more attractive than a clear bill of health? By eating less meat, you’ll be less likely to have clogged arteries, you’ll reduce your risk of cancer, and you’ll probably be thinner. You’ll eat more fiber and anti-oxidant rich foods (thanks to the vegetables you’ll be eating) which will make you glow. The most expensive items on your grocery bill are most often meat. You’ll be rolling it! With all that extra money (some sources say up to $4K a year), you can buy a massive rainbow of beautiful produce. 5. You’ll avoid nasty toxic chemicals. Did you know most pesticide residue comes from animal products? Many of them can’t be eliminated through cooking. If you want to reduce your intake, go meatless or buy ethically raised meats. 6. You’ll lower your risk of getting sick. When was the last time you had food poisoning? It was caused by an animal-based food, right? Knew it. Stick to veggies and avoid those really, really unpleasant symptoms. 7. Veggies are easier to cook. No more cleaning raw meat, no more intensive labouring over the bird or the roast, no more uncertainty over whether it’s done cooking. Eating veggies are key to a lower-stress life. Some doctors say eating a plant-based diet can add about 13 years to your life. And you’ll age less quickly! Animal products clog arteries, reduce energy and slow down your immune system. So, keep eating factory farm meat if you want to spend your last years in poor health and discomfort. You won’t have to jet home to put your very inconveniencing dairy/meat products in the fridge. Vegetables are more than happy to wait for you in the car. 10. Because Ellen DeGeneres does! Here’s what motivated her to go vegan. ‘Nuff said. Here’s a list of documentaries to learn more on this topic.